by Matthew Scroggs. Published on 13 March 2016. It all began in December 1956, when an article about hexaflexagons was published in Scientific American. A hexaflexagon is a hexagonal paper toy which can be folded and then opened out to reveal hidden faces. 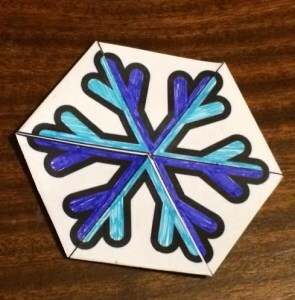 If you have never made a hexaflexagon, then you should stop reading and make one right now. Once you’ve done so, you will understand why the article led to a craze in New York; you will probably even create your own mini-craze because you will just need to show it to everyone you know. The author of the article was, of course, Martin Gardner. A Christmas flexagon. Make them with our how to make a flexagon guide. Martin Gardner was born in 1914 and grew up in Tulsa, Oklahoma. He earned a bachelor’s degree in philosophy from the University of Chicago and after four years serving in the US Navy during the Second World War, he returned to Chicago and began writing. After a few years working on children’s magazines and the occasional article for adults, Gardner was introduced to John Tukey, one of the students who had been involved in the creation of hexaflexagons. Soon after the impact of the hexaflexagons article became clear, Gardner was asked if he had enough material to maintain a monthly column. This column, Mathematical Games, was written by Gardner every month from January 1956 for 26 years until December 1981. Throughout its run, the column introduced the world to a great number of mathematical ideas, including Penrose tiling, the Game of Life, public key encryption, the art of MC Escher, polyominoes and a matchbox machine learning robot called Menace. Gardner regularly received topics for the column directly from their inventors. His collaborators included Roger Penrose, Raymond Smullyan, Douglas Hofstadter, John Conway and many, many others. His closeness to researchers allowed him to write about ideas that the general public were previously unaware of and share newly researched ideas with the world. In 1970, for example, John Conway invented the Game of Life, often simply referred to as Life. A few weeks later, Conway showed the game to Gardner, allowing him to write the first ever article about the now-popular game. Any dead cell with exactly three live neighbours becomes alive. The collection of blocks on the right of this game is called a glider, as it will glide to the right and upwards as the generations advance. If we start Life with a single glider, then the glider will glide across the board forever, always covering five squares: this starting position will not lead to the sad ending where everything is dead. It is not obvious, however, whether there is a starting configuration that will lead the number of occupied squares to increase without bound. Originally, Conway and Gardner thought that this was impossible, but after the article was published, a reader and mathematician called Bill Gosper discovered the glider gun: a starting arrangement in Life that fires a glider every 30 generations. As each of these gliders will go on to live forever, this starting configuration results in the number of live cells perpetually increasing! This discovery allowed Conway to prove that any Turing machine can be built within Life: starting arrangements exist that can calculate the digits of pi, solve equations, or do any other calculation a computer is capable of (although very slowly)! Another concept that made it into Mathematical Games shortly after its discovery was public key cryptography. In mid-1977, mathematicians Ron Rivest, Adi Shamir and Leonard Adleman invented the method of encryption now known as RSA (the initials of their surnames). Here, messages are encoded using two publicly shared numbers, or keys. These numbers and the method used to encrypt messages can be publicly shared as knowing this information does not reveal how to decrypt the message. Rather, decryption of the message requires knowing the prime factors of one of the keys. If this key is the product of two very large prime numbers, then this is a very difficult task. One solution of this equation is $t=619$ (calculated via the extended Euclidean algorithm). Gardner had no education in maths beyond high school, and at times had difficulty understanding the material he was writing about. He believed, however, that this was a strength and not a weakness: his struggle to understand led him to write in a way that other non-mathematicians could follow. This goes a long way to explaining the popularity of his column. After Gardner finished working on the column, it was continued by Douglas Hofstadter and then AK Dewney before being passed down to Ian Stewart. Find a number base other than 10 in which 121 is a perfect square. Why do mirrors reverse left and right, but not up and down? Every square of a 5-by-5 chessboard is occupied by a knight. Is it possible for all 25 knights to move simultaneously in such a way that at the finish all cells are still occupied as before?